Passengers aboard a tundra buggy tour to the Churchill Wildlife Management Area in Manitoba, Canada watch a Polar Bear cub but at the same time, the cub watches the passengers. Not quite a year old, a Polar Bear cub sits on the partially frozen tundra of the Churchill Wildlife Management Area in Manitoba, Canada, watching people aboard a tundra buggy. The cub is not threatened in any way, just very curious, but be assured that the mother Polar Bear is very close by. The mother will protect her cub if she senses any danger and the aggressiveness of an adult Polar Bear is not something one wants to witness at close range. 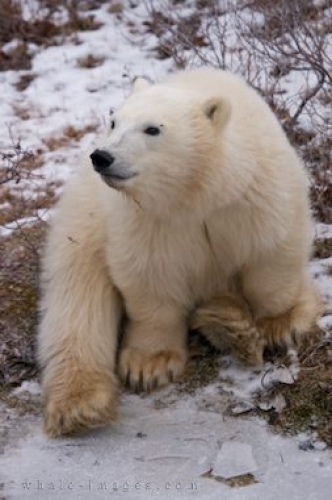 The only two things which threaten a Polar Bear are humans and other adult Polar Bears. Growing very quickly, this cub was approximately 16-24 ounces at birth and about 12 inches in length. The eyes remained closed for the first month and its appearance was that of a helpless, nearly hairless animal. The Polar Bear cub grows extremely fast, opening its eyes within the first month, walking about its den around two months old while nursing the entire time off its mother's fat, rich milk. Their fur has flourished and their teeth have come through when they leave the den for short periods in March or April weighing about 22-33 pounds. As the Polar Bear cub grows and the waters of the Hudson Bay become frozen, the mother will venture to the shores where she will teach her young how to catch ringed seals and winter survival techniques. Feeding on its mother's milk and seal blubber, the Polar Bear cub will weigh over 99 pounds at around eight months old. For the first two or three years of the cub's life, the mother will tend to its needs and continue to nurse and then the cub will be able to fend on its own in the wilderness around its third year. The Churchill Wildlife Management Area in Manitoba, Canada is the best place to view these beautiful marine mammals in their natural habitat, but booking a Tundra Buggy Tour should be done well in advance. Most people try and book their tour to see the Polar Bears within the first two weeks of November as the Hudson Bay is not frozen enough and many of the Polars Bears still wander about the tundra.